"Jack Kerouac meets Johnny Cash... in Bakersfield." 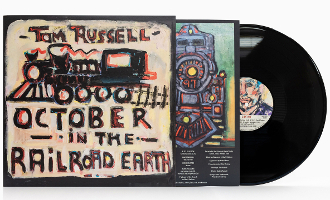 Ten new original Tom Russell songs, including the title song from the Irish film "Small Engine Repair," featuring Bill Kirchen on lead electric guitar and Eliza Gilkyson singing backup. The GRAMMY-Award winning Texmaniacs appear on "Isadore Gonzalez," a track about a Mexican cowboy who died in England during Buffalo Bill's Wild West Show.